Good To Begin Well, Better To End Well: Cover Reveal for THE QUEEN AND HER BROOK HORSE! If you're a newsletter subscriber, you've already seen this--but for the rest of you, the moment you've been waiting for is HERE! The Queen and her Brook Horse cover art, AT LAST!!! Before Arianna met Bolthorn, Signy, queen of Gautar, made a bargain with a brook horse. 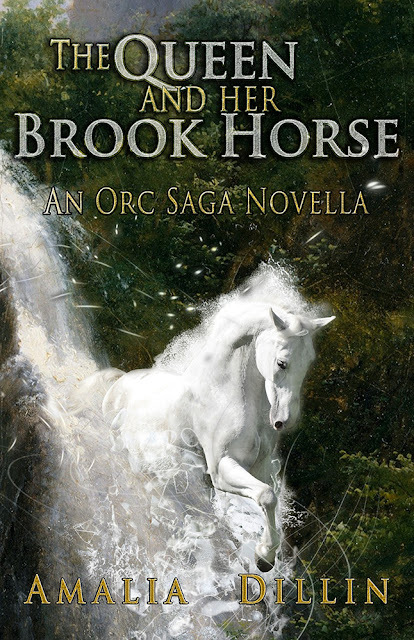 But brook horses are fickle creatures and their magic is wild at best; if Signy cannot keep her promises, it will cost them both--and the blood that's spilled between them will be the least of it. And it's up on Goodreads, now, too--so be sure to add it! THE NEXT ISSUE OF THE AMALIAD WILL CONTAIN A LINK FOR THIS NOVELLA, FREE FOR SUBSCRIBERS. It'll be a downloadable pdf! I am not going to promise that the link will stay good and live forever, because authors needs to eat, but I promised you a freebie and even though it's about 3 times longer than I had hoped, you're going to get it. That said, AFTER subscribers get the novella first first firsty-first, I'll be putting it up on Amazon for kindle and also (!!!!) because of the length of this monster, I'm 99% sure I'll be able to do a print edition too. Which I am personally excited about! Timing of getting it up for SALE is a little nebulous because I can't do what needs to be done to make that happen until I'm done editing, which starts TODAY. No, Bolthorn is not in this novella. This is a fantasy with romantic elements, but NOT, I repeat: NOT, a Romance.